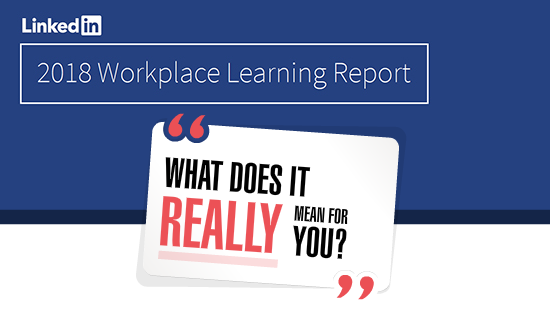 The 2018 LinkedIn Workplace Learning Report – What Does It Really Mean For You? It’s the start of the new financial year for many companies. Naturally that signals the time for making plans and figuring out the needs of the organization for the upcoming period. In fact, the latest LinkedIn report on workplace learning may reframe the focus for organizations to initiate plans for a longer period. We agree with the consideration that it’s definitely timely to think of longer spans to address in training plans. We do disagree with the LinkedIn focus, but before getting into that, let’s answer the basic question. What’s different now from the last year? Perhaps not a lot. But consider the last two years or so and there have been some changes. We identify 3 important influences. While the training world has been discussing AR, VR, and MR for a while now, even in terms of device affordability, SDK options, and actual deployment, there has been a surge in the last year. We are also seeing a renewed and more serious interest even in older technologies like mobile-first training to meet the needs of on-the-job, just-in-time, and performance support training. Previously, organizations were interested but the conversation would die at reality check points like “Do we have a responsive LMS?”, “Do we provide devices or have a properly implemented BYOD system?”, or even “How do we control the security of the content?” By now, there is a lot of precedent to learn from and the solutions to these challenges are well-known. the world has known millennials for a very short time, we don’t know how many parts of the observable or common culture is just a part of their growing up and how many things they will outgrow or change in as adults. predominantly America-centric a framework, and so at times it may be inaccurate or inadequately representative when considering the same age group in other countries. However, whichever school of thought a talent or training head may lean towards, the sheer volume of noise being made over the presence of this generation has acted as a thunderbolt to make us sit up and notice the cumulative cultural changes that organizations have weathered and now may wish to consciously prepare for in the coming decades. Like any other industry training is not static. Over time, it becomes in some ways at least, more standardized, the common body of knowledge is added to and performance expectations and measures of success increase in sophistication. Corporate training has long known the inadequacies in the ways by which learning is tracked and measured. Now, while we have not all transitioned to that awareness (let alone tackled the problems), conversation about how to align training to business metrics and goals is certainly increasing. While this is not a shift confined to the last year, taken in combination with the other factors mentioned before, it certainly compounds why it may be worthwhile to reevaluate how organizations go about planning to develop, train, and build talent. We have grave concerns about much of the report. There are problems in aspects of the survey design, survey methodology, data interpretation, and the manner in which the conclusions are drawn. There is moreover a larger body of more established research and analysis that cautions against rushing to accept the insights of the LinkedIn report. What are the top priorities for your L&D programs in 2018? Really, that’s exploding with possible interpretations! Prioritized how? By monetary investment? Hours of training? To track impact? Effort to build in-house capability for? The question has a much wider scope until the options whack it down to being ‘which content focus’. Even keeping in mind that this editorial is written by an Instructional Designer, a breed that specializes in getting itself tangled up by overthinking, those options are skewed, unclear, and strangely phrased. Why just (soft) skills? Training also addresses domain knowledge and behavioral conditioning alongside functional skills and cognitive skills. There is no opportunity to consider any of these in the closed option set given. Soft skills are simply the easiest to address, ‘safest’ and easiest to build an argument for. Does that make them the right focus? So if the organizations value consistency in their training offerings they are necessarily not in favor of training for soft skills? ‘Value’ and ‘consistency’ – how are we defining these? And therefore, what does this option even mean? What if an organization surveyed is not a global organization or the person surveyed is focused on only one geography – is this option not applicable? You would think that even for soft skills training to be done rigorously, some kind of TNA would be called for. Would that not deliver insights on internal skill gaps? If we follow methodical design for the top priority, this option is implicitly also selected. ‘Skill competency’ is not a clear or commonly used term. In fact, we’re not even sure it makes sense – possessing a skill implies a person is competent. It seems redundant to speak of skill competence. Our guess is that this is perilously close to skill development (the previous option), about how to analyze jobs to identify skills, how to gauge the level of skill a person possesses, or … let’s stop there, you get the picture. Until now the priorities were in terms of what the Training/Talent Development functions would offer the business. In typical training terms, they implied some kind of tangible, perceivable focus. Here we have a sudden option that is inscrutable. Given that organizations do spend huge amounts of money on digital means to deliver training and development, is this about the impact of technology on training? On the core business? And what it will mean for the organization’s skill set and ability to stay competitive? Many organizations undertake digital training. The training industry has been growing over the years. Would you not need to understand the impact of technology to know how it can be intelligently leveraged in your organization to, say, deliver consistent training? Track skills? Let’s take a very common and widely relatable training context: sales enablement. Let’s say we’re talking about a large company with offices across the globe. Put yourself in the place of the Training Head for a geography. You want to improve the performance of the sales team in that territory. How would you answer the question we’ve just seen? Are you going to say soft skills are the only priority to focus on, even about product knowledge? How else would the training be ‘valuable’? Of course, you may roll out the trainings to all areas, but you typically start with one and then ramp up. You would want consistency in the trainings too (which technology could help with). And understandably, you wouldn’t be able to deliver valuable, substantial training to boost performance until you also figure out a way to measure skill gaps or skill levels required at each level of the sales organization. It’s absurd and impossible to pick one step in a process as the ‘top priority’. As the shelf life of skills shrinks, business leaders worry that talent developers are focused on training for today’s skill demands, at the expense of preventing tomorrow’s skill gaps. We told you there was a problem with the conclusions as well. We see it here with the broad assertion that “the shelf of skills shrinks”. This is completely unsubstantiated. The more specifically framed report conclusion was from the WEF, which had also more reasonably presented a contextualized discussion of the influence of technology evolution on technology-linked jobs. More importantly, the report had repeatedly emphasized the importance of cognitive abilities as being still very much needed in the future, but no doubt needing more investment of effort spread consistently across a person’s education and workplace. And thus training conversation trends are born without substance, reasonable evidence, and logic. There are many logical gaps and problems in the report. Again, let’s look at two illustrative examples. For the first one, we will put together the 3 pieces of information about an issue to look at how these are then illogically addressed in the report’s recommendation. Each group in our survey identified ‘getting employees to make time for learning’ as the #1 challenge facing talent development in 2018. […] 94% of employees would stay at a company longer if it invested in their career development. From this, you would understand that work happens at a constant and rapid pace. Employees are not able to interrupt the flow of activities to switch to learn. That’s a clear enough picture. The modern employee wants to take time to learn when they’re in the office. They want opportunities to learn at their own pace and to access learning at the point of need. Okay, what they’re asking for is for the way of working to evolve, so that learning can be included in the flow of daily business activities. That’s again a clear piece of information. It’s also a common problem and something that everyone’s trying to figure out because it’s easier said than done. Employees, especially millennials, feel empowered to make a difference in their organizations and the world. They’re inspired by opportunities for personal growth. Talk about learning’s impact on an employee’s journey to where they want to be and the impact they want to have. Employees are motivated by manager relationships and learning tied to promotion paths. Help managers understand the impact they can have on employees. Help employees understand which qualities they need to cultivate to get to the next level in their careers. Employees are your best source of feedback on your tools and programs. Find out what they want from learning opportunities, and get them involved in making change within the organization. What learning resources do you use to train employees? No part of the problem – pace of work not permitting time to learn – has actually been addressed in the recommendation. Training Managers may ask what employees want from learning opportunities, which seems like a good practice that’s hard to fault, but given that the issue is learners are saying they can’t take up the training experiences, following the recommendation means Training Managers would miss the point entirely. The most used format (in 2017 and 2018) – ILTs. In fact, more people have reported using ILTs in 2018 than in 2017. What learning resources do you use to train employee? It seems as though the survey questions were never tested or tested inadequately. Because after the organizations surveyed indicated they don’t use as much digital training as classroom training, they were then asked about what was so advantageous about using digital media. Talent development professionals are most excited about digital learning solutions that can support quick takeaways, immediately solve needs, and provide great engaging content. They were no longer the right audience to ask! Yes, digital is powerful. But no it cannot wear a red cape and fly faster than a speeding bullet. What does a claim like “immediately solve needs” even mean? It’s a dangerously vague promise for a training function to make, and will be an express ticket to a lack of credibility. Given the problems with the survey, it is only due diligence to check if the report is able to deliver on any of the questions it set out to answer. Why do employees demand learning and development resources, but don’t [sic] make the time to learn? But you don’t actually get answers to any of those questions. Or, if we try to understandingly re-interpret the third question in terms of what they meant rather than what they say – What do executives think about learning and development – maybe there is a partial answer to one question. You do not get to know about differences in practices between savvy and ineffective talent development leaders, unless the researchers are making the claim that every talent development person they reached to was in the ‘savvy’ category. There is also actually no definition of the differential. Considering the report purports to have identified the strategies of trail blazers, we think it’s kind of a big miss to have not even figured out who the trail blazers are. Meet them on platforms they’re already using with messages that align to their on-the-job needs and professional aspirations. That was the advice given to talent development. So the problem isn’t about not making time from work in general but rather, not making time on specific platforms (LMSs?) on which the learning material is hosted…? One is left bewildered and uncertain. Take that question literally first – wouldn’t it have actually been brilliant to know how people think? What techniques do they arm themselves with, what sources of information, how many years into the future do they factor in their plans…? But alright, let’s extend the benefit of the doubt and say the question intended was “what”, not “how”. For all the hullabaloo about millennials, how about considering what Talent Development Heads are doing to ensure that they and their organizations actually understand this generation or what characterizes them? For instance, one possible consideration for the future could be actually factoring into training and development plans that in some countries students are underperforming in their reading levels. So, the workforce in 5-10 years may need to deal with even less qualified or knowledgeable candidates. Are organizations pushing for stronger induction training? To answer this question, the first step would be to define the parameters to identify successful learning programs (missing in the report), and study learning programs that came close but missed so that we know which differentiating factor makes for success (also missing in the report). We grant you (in fact, we’re quite sure) that if these preliminary steps were to be conducted, we wouldn’t get a single conveniently clear answer – it would actually open up more questions. But to not pursue that simply isn’t rigorous. And so no, yet again, we have no answer. The report fails to provide an answer to any of the questions it defines. It leaves us with little that is concrete or clear enough that we can take away as evidence on which to base practice or decisions. Worse, the well-meaning Talent Development or Training professional who scans the report and doesn’t have time to track down its references/ other validating sources is left with misleading advice. Mridula has worked in ID for 10 years. Before that, she worked in various fields from human rights advocacy to game design. The logic behind the seeming randomness is that she is passionate about creating order from chaos and loves working with people and words. As an ID, she has had the joy of working on a variety of projects - corporate and K12, ILT and eLearning, conventional and creative. She has also conducted classroom trainings. She has multiple interests - psychology, gardening, design theory, politics, feminism, music and critical theory are a few - and is an unabashed idealist. She thrives on variety and translating theory into practice. Mridula is proudly powered by filter coffee.